I don't have ideas for them, but "a couple mile's worth of line" is not typical for kites. That is a lot of line. Most nations have a maximum height limit before additional regulations kick in. In the US that's 400 feet. In the UK that's 60 meters, about 200 feet. Other nations all have similar restrictions. Anything over those heights requires clearance from the local aviation authority like the FAA or CAA/CAO or similar. Being at "a couple miles" puts you in the flight path of non-commercial flights, and 5 miles gets you to where commercial jets fly. Low-flying flights like medical helicopters or areal surveys commonly have a 1000 foot / 300 meter flight height. Because kites fly at an angle you can have a little more line than that, that's often around 500-600 feet of line before hitting the 400' flight ceiling. Also, reaching those heights will have significant other issues, atmospheric winds are different than what you get near the ground. Extremely high winds are common, with air currents reaching what would be tornado speeds if they were on the ground. High altitude streams and jet streams can reach several hundred miles per hour. 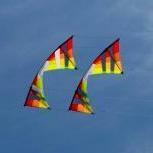 Partial deliveries and drop shipping on the rest are fairly common at all small stores, not just kites. Sometimes Revolution (and other kite manufacturers) don't have something on stock, either. It sounds like they sent an email to tell you about the backorder and shipping refund, but yeah, probably a phone call would be even better. I just received 2000 lb Spectra Hollow core from TwinLine llc. This line is thin, lightweight and Strong. Awesome company to deal with and John Kiker is a kite flyer. I am going use this for the 12m pilot. The Peter Lynn pilot is a beast. They recommend no less than 1200. Since the 2000 lb Spectra is stronger and lighter than most lines I have used before I decided to go with it. Peter Lynn is recommending a 4400 Lb line for the maxi series kites. My Octopus falls into the Maxi 100 ft or larger range. They recommend no less than 5mm line because the line diameter is easy to handle and the pull generated by the Octopus. I asked if it was because of handling or for the tensile strength but have not received a response back at this time. Curious to know what the actual pulling force is on the kite. I can get a 4000 or even a 5250 tensile strength from TwinLine. The factory said the line is around 3-3.5 mm diameter. When comparing those lines to some of the others on the market it is cheaper to go with the stronger line. I compared diameter of the lines, pricing and strength. Still half the cost of anything else. I have read some others posts about the trilobite heads. Most people say it generates a lot of lift and pull. Some people are using it for a lifter. How is the pull on your 12m trilobite? I have the small 6ft head and that pulls pretty good in the higher wind speeds. Since most kite manufacturers only provide a recommended flying line suggestion I am trying to figure out what is the best way to measure actual pulling force of kites. I have thinking of using a small crane hanging scale on the line thought if I put two caribeaners on the line and then hook the scale in between them I could get some readings on pull. I wish manufacturers would list pulling strength of kites. I think we could then size our lines properly to the kite. This may save some money on line or even save a kite from a line break and losing your kite. Let’s here from more people. I am very interested in knowing what lines on what kites everyone is using.